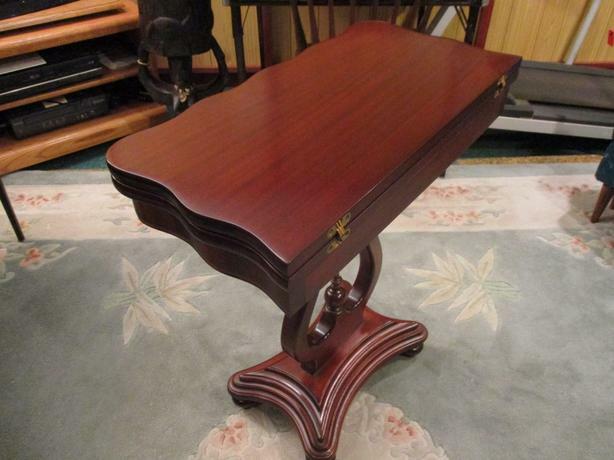 THIS IS A SOLID WOOD MAHOGANY GAMES TABLE. WHEN FOLDED CLOSED IT IS 26 INCHES WIDE, 13 INCHES DEEP AND 29 1/2 INCHES HIGH. THERE IS A HINGED TABLE TOP THAT FOLDS FOREWARD TO DOUBLE THE TABLE TOP SURFACE TO 26 INCHES BY 26 INCHES SQUARE. TO EXTEND THE TABLE TOP YOU SWIVEL THE TOP 80 DEGREES AND LIFT THE HINGED PORTION AND REST IT ON THE RECTANGULAR WOOD FRAME UNDER THE TABLE TOP. THIS FRAME HOLDS THE TABLE TOP SECURELY AND ALSO HAS A RECESS TO STORE DICE, CHIPS, CARDS ETC. THIS RECTANGULAR UNDER FRAME RESTS ON TWO HARP SHAPED LEGS. THESE LEGS EXTEND TO A TIERED BASE AND FOUR ROUND TAPERED CARVED FEET. TO RESTORE THE TABLE TOP TO THE CLOSED POSITION YOU FOLD THE TABLE TOP FOREWARD AND SWIVEL THE ENTIRE TABLE TOP 80 DEGREES TO ITS ORIGINAL POSITION TO REST ON THE RECTANGULAR WOODEN FRAME. IT IS BOTH UTILITARIAN AND A STUNNING PIECE OF FURNITURE.